April | 2013 | I blog here ! Are ye sure, you wunna read t'is ? I am making an effort to learn Angular, and tried the tutorial on the Angular JS site. The Phone Cat tutorial was very good, but I couldn’t complete it, for reasons I don’t recall. But after reading, Sebastian’s Blog, I thought I should try learning about it again. 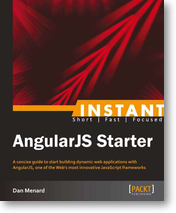 Thus it lead me to the Instant AngularJS Book on Packt Pub, which is my favorite for open source technologies.